Tsubasa: Reservoir Chronicle | Anime With A Side Of Sarcasm! In the XXXHolic dimension they find one of Sakuras feathers. The Dimensional Witch explain to Syaoran what the true meaning of them are and shows him what to do with the feather (help her absorb it back into her body) which this one helps her to come out of the her catatonic state but with no memories or anything. Basically a shell of what she used to be. She tell him that they must travel through all the dimension to gather her feathers. Each feather has a bit of her memory and soul in it so when she absorbs it back in her body she will start to regain her memories and turn back into how she was before. Syaoran is given the shpeal about ‘if you make a deal me to help you recover the rest of the feathers, I in exchange I want something that is of equal value’. This cost is Sakuras memories of Syaoran. He is willing to do anything for her so he agrees knowing that Sakura will never know of their past and their relationship. The Dimensional Witch agrees to help Syaoran find the rest of feather and to help with this she assist with pulling two other people from two other dimensions into hers. The Dimensional Witch also helps by popping up from time to time throughout the anime to assist with issues in other dimension and creates the XXXHolic/Tsubasa crossovers. First is Kurogane, a ninja from the world of Japan. Kurogane is the most powerful ninja/warrior in his world but was getting too cocky about it. The princess in his world, Tomoyo, sent him away to help him find his true strength, power and to knock him down a few notches. Of course Kurogane was pissed to all hell about this and made it very clear that he was not happy. Because he was not getting the hint the princess put a curse on him that if he was to kill someone he would lose part of his power and strength. When he makes it to the XXXHolic dimension he is forced to give up his sword in exchange for the use of the white Mokona Modoki which will help him and the others to pass from dimension to dimension. This is also how the Dimensional Witch is able to communicate to the group. Mokona is like a Skype enabled rabbit thing that they can see and talk to her and she can see and talk to them. (See XXXHolic to find out more about the Mokonas). 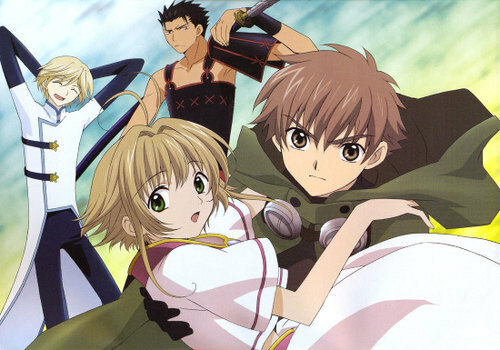 Kurogane is reluctant at first to assist Syaoran and Sakura but soon realizes this is his only way back to his Japan and to the princess. Side note on this, I totally think that there was some serious love story between the two but they never really got into the whole thing. Only bits and pieces. The next character to join the group was my fav, Fai D. Flowright! Fai, as he is called throughout the anime, is a powerful magician from the dimension Seresu. He unlike the others sent himself to the Dimensional Witch after he sealed away the king of Seresu. In exchange for the use of the Mokona he gives up the giant tattoo on his back that is the key to his powers. He still have some basic powers left but decides to not use them during his journey because of what happened in his dimension. Together the four of the them along with Mokona are sent off to the first dimension to hunt down the feathers. They are given a warning along the way that other might also be after the feathers and not every world has one on it but it is there duty to try and find them. Throughout the anime they are sent from dimension to dimension looking for feathers and fighting off people and other sorcerers that are after the powers that Sakuras feathers contain. (There is yet another arc in the story where Fei-Wang Reed another powerful magician in another dimension is out to get Sakura and Syaoran and is putting up obstacles where he is can. This is one of the larger secondary arcs throughout the anime.) As the story progress the feather are found slowly but surely and Sakura starts to regain her memories minus Syaoran. This part was a bit odd since during each episode that she finds a feather they have a flashback moment to the memory it contains. If it was of her and Syaoran and she was talking with him, well it is now of her talking to herself or to the spot where he was. Craziness. The group gets closer also and begin to form a strong bond which helps them with each world that they travel too. ***There is a short movie that came out call Tsubasa: Reservoir Chroicle movie The Princess in the Birdcage Kingdom that was released on August 20, 2005 which is basically a 35min long movie. This was a ok movie but it really was just another episode that was few minutes longer than normal. There was of course some of the same crossover stuff with XXXHolic but nothing too special. This was also released on the same disk with the XXXHolic: A Midsummer Night’s Dream movie. 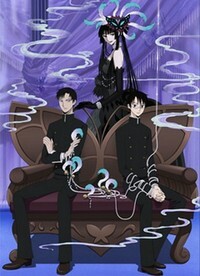 XXXHolic is one of my favorite Supernatural anime’s. There are no huge fight scene, no big love story (even though there is underlying arc that is about the main character Kimihiro Watanuki’s crush on Himawari Kunogi from his class. Its doesn’t over indulge into the love story but it’s enough to give it some feeling and not keep it so dark). The plot is based around a highschool kid names Watanuki who is plagued by the ability to see yōkai and ayakashi (spirits, demons…etc.) that for some reason have a very strong attraction to him to the point of almot smothering him at times. He is the only one that can see these spirits and to the people around him they think is a bit ‘off’. For this he has no real friends and is a loner. His parents aren’t around so he lives by himself which makes dealing the ayakashi more difficult. The story starts off with him stumbling into a mysterious shop as he was trying to get away from a group of ayakashi that were trying to swallow him up one day. This is where the main female character comes in named Yūko Ichihara who is a the owner of the shop. This is a place where she makes deals with patrons that happen into her shop to grant wishes in exchange for something of equal value. Helping her in the shop are two AI’s Maru & Moro along with Mokona Modoki which refers to two bouncy rabbit like things (one black and one white) that were created by Yūko and a cross over character Clow Reed who is a sorcerer and some might say Yūko is one too. *So to explain the crossover bit for a second. XXXHolic has a strong crossover in the storyline with Tsubasa: Reservoir Chronicle. However in the Anime it is shown more in Tsubasa. The story goes that the soul of a girl names Sakura was taken in another dimension after a fight broke out with warriors from yet another dimension that arrived at a set of ruins, that she was at with her friend Syaoran, through a portal . Her soul was captured and turned into feather that were dispersed out through other dimensions. After her soul was turned into feather and left her, she fell into a catatonic state leaving Syaoran devastated and willing to do anything to try and save her. He along with the now catatonic Sakura, are transported to Yūko in the XXXHolic dimension. In this anime she is referred to as the Dimensional Witch. Syaoran is given the shpeal about make a deal and in exchange I want something that is of equal value. This cost is Sakuras memories of Syaoran. He is willing to do anything for her so he agrees… I will cover more of this one later but this is to help you get a bit of the cross over part. Ok back to XXXHolic. Yūko learns of Watanuki’s abilities and agrees to help rid him of his plague if he works in her shop. Well working in the shop meant be her B**** lol! He is left with cleaning, cooking, running errands, assisting with people that come in the shop, late night runs to buy Sake since that is ALL she drinks all the time. Yūko even uses Watanuki’s abilities to help other people that are being haunted by ayakashi or possessed by yōkai. Through these customers Yūko helps Watanuki to learn to deal with/control his abilities. Another classmate of Watanuki’s is Shizuka Dōmeki who doesn’t have the ability to see yōkai and ayakashi but, can sense them and also exorcise them ends up coming in about ¼ of the way through the series. His family owns a shine that he lives and works in which has given him this power through his family’s history and shinto practices. Yūko finds out he is like the Yin to Watanuki’s Yang during one of her ‘consultation’ that ended up dragging him into it. He and Watanuki don’t get along since Watanuki is a loner at school and Dōmeki is more popular and friends with his love interest Himawari which also makes Watanuki jealous of him. The two end up getting paired up more often than not throughout the series and end up creating an odd sort of friendship as they fight off and free people from unwanted yōkai and ayakashi. They also become better friends with Himawari who is oblivious to what is going on but is just a good natured girl that likes the two of them. This was a really good anime for the fact that it really delved into the darker side of yōkai and ayakashi. Most of the time I want action action and more action but this was a nice change of pace. The ending of the anime leaves you wanting more but sadly that is it. ***There is a movie that came out xxxHolic: A Midsummer Night’s Dream released on July 20, 2005 which is basically a 60min long episode. To me it could have just been a regular 24 min episode since it seemed to drag on and on. One good thing from it is that you see some the crossover parts with Tsubasa: Reservoir Chronicle. This was also released on the same disk with the Tsubasa: Reservoir Chroicle movie The Princess in the Birdcage Kingdom.